My mother was a gifted nurse. Doctors used to consult with her all the time when they were not getting good results with their patients and my mom was always able to help them be better doctors. She had a gift for understanding and seeing things which others could not, and was highly intuitive and empathetic. I was blessed to inherit those qualities from her. She was also a poet and an artist and taught me a great appreciation of art and nature. My father was a police officer of 22 year’s experience. He was very highly respected by his fellow officers and recognized by his superiors for outstanding service. Unfortunately my mom and I lost him when I was four years old as he was killed in the line of duty. This devastated my mom (I was too young at the time to really understand what had happened). Afterward, she couldn’t bear to remain in the old neighborhood with the old friends. She needed a new start far away … a fresh beginning. As my father was one half Navajo my mother decided we’d move to New Mexico to be with some of my extended family. We lived with on a small Navajo reservation northwest of Santa Fe. I was five years old when we moved there. We did travel several times back to Germany to visit other family and friends, as my father was also one half German, but most of my growing up years were spent on the Navajo reservation in New Mexico. By my Navajo grandmother, my father was part of the Navajo clan of healers and medicine people. Thus, at the age of five I was introduced to Native American natural medicine, herbal medicine, healing plants and health ceremonies. 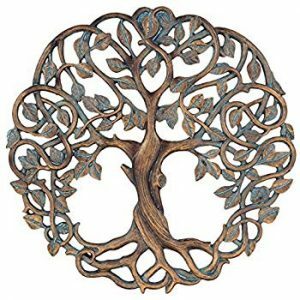 From my mother I learned to appreciate Western medicine and science, and so my outlook became a blend of both the more technologically-oriented science, combined with Native American natural medicine. There is a comprehensiveness and completeness to the Navajo way of looking at life and health. 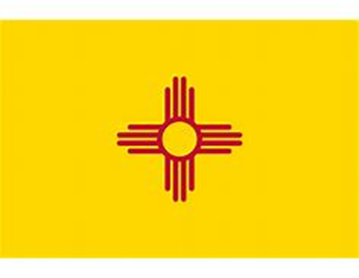 The New Mexico state flag reflects this. The circle in the middle represents the sun, the circular nature of existence, a completeness, the radiating lines outward represent the cardinal directions of north, south, east and west. 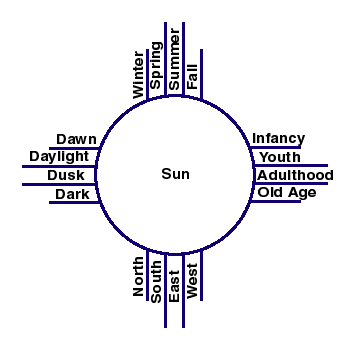 They also represent, dawn, daylight, dusk and night as well as birth, youth, adulthood and old age, and the four seasons of winter, spring, summer and fall. This is a very comprehensive, complete picture of how Navajo’s view life and health. I studied long hours from the age of five until we left the reservation when I was twelve years old. I learned not only a lot of interesting and very practical information about herbs and healing plants, but also a deep and abiding reverence for life, how sacred life is or should be, and how we human beings suffer needlessly so much when we get disconnected from that sacredness of life, the gift of being. Native Americans refer to the Great Spirit who created everything and everyone, who watches over his creation, who teaches his people and protects them, helps them live sacred lives in reverence and gratitude for what they have been given. When I was twelve we moved to California, as my mom wanted to return to nursing and there were more opportunities in California than in New Mexico. After I completed middle and high school, I entered the United States Army. I wanted to do my duty and serve my country before deciding what to do with the rest of my life, what career I wanted. Because of my language skills (as a child I learned Navajo, Spanish and German, in addition to English) I was selected to pursue a military career reflecting those skills. After basic training, I was sent to the United States Defense Language Institute in Monterrey, California, to study German and Russian. Following that training I was deployed to Berlin, Germany, where I was given a field commission and worked as an intelligence officer for the Army Security Agency (ASA), the military branch of the civilian National Security Agency (NSA). While there I was thinking about a career in the military but also I had a pull to do other things, because of my earlier studies in both Western science and Native American medicine, and to consider a career in health care. Although I was asked many times to remain in the Army as my work was respected in my field of service, I decided to apply to the medical college in Berlin, the best medical school in the entire world. I was accepted and while finishing out my military obligation I began my medical studies which I continued after completing my military obligation. 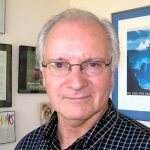 I studied classical western medicine, but my interest in Native American healing was certainly a big and important part of my evolution as a health care provider. Now, after all my years of training and practice in family medicine, I am able to combine the best of both traditions when working with my patients. I love what I do, it is incredibly humbling but also exciting and rewarding. I got that from my mom, who loved helping people live better, healthier, happier lives. Recently I was at a medical conference and there were doctors there with gray hair like I have, and there were younger doctors. My answer? I’ve been a doctor most of my life, many years, and I have never actually heard people complain and complain. What I have heard is people being fearful, concerned, scared, uncertain what’s happening to them and needed help, needing answers, needing a friend to listen to them. That’s what I hear and that’s what inspires me each day. I have done this all my life and I awaken every morning anxious to see who I will help that day in the office. I’d ask you to think about your life, the gift of life, in the way Navajos think about it – the all-inclusiveness of it, the comprehensive nature of it – and to embrace those gifts and let them grace your life and touch your heart and dedicate yourself to living a sacred, grateful life and helping those less fortunate, those needing uplifting, courage, love and security. We are, after all, all members of God’s family, all His children, and the way we show our gratitude to Him for these gifts is to honor what He has made and what He has given us. May you and those you love know this in your hearts, and have a most blessed and sacred Christmas season. In Navajo way say “Ya ta Heh”. it means “hello, be well”.